USTA Florida's "Share the Love" grant program, initiated last year by the USTA Florida Board of Directors to grant 10 and Under Tennis equipment and other facility, school and program support to Florida tennis organizations, has surpassed the $300,000 mark in awarded funds. "It is exciting to look back at the growth of the Share the Love grant program and truly realize the tremendous impact that the $300,000 funding has had in so many communities around the state," said USTA Florida Director of Community Tennis Linda Curtis. "As budgets continue to get slashed across Florida, even small grant awards can help with needed tennis opportunities for Floridians of all ages. In stressful times, it is even more important that we have healthy activities like tennis to relieve stress, engage us in healthy physical activity, and bring families together for fun." 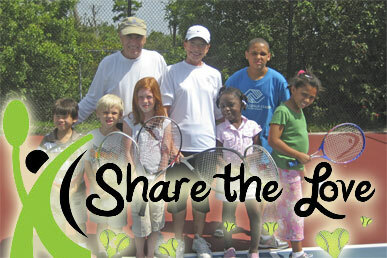 Since its inception in the spring of 2010, more than 200 grants have be awarded to support tennis in Florida communities. Grants to support 10 and Under Tennis have been the majority of awards, but awards have also gone to public facility funding (schools, parks, conversion to 10 and Under Tennis courts, etc. ), community tennis awareness (innovative pro-active start-ups, program expansion), and senior tennis programs and projects. In late April through mid-August 2011, USTA Florida announced 39 additional facilities, schools or organizations in Florida (see listing below) that have received "Share the Love" grant assistance. The majority of 10 and Under Tennis equipment grants ranged from $500 to $2,500 in assistance, and resulted from applicants filling out a simple web-based form and project budget for grant consideration. With Florida schools experiencing more than $1.75 billion in budget cuts, many schools have no funding for new equipment or are facing eliminating sports programs altogether. In Miami the Lille C. Evans Elementary School will later this month begin its "Serving Up 'A Healthy Body is a Healthy Mind' Tennis Program," which will run through June 2012 at the challenged Title I school. "Appropriate funds are not currently being allocated, and we are unable to provide the most up-to-date physical education curriculum to augment the academic components and maintain students' interest in learning," said Suzanne Wojcik, physical education teacher who applied for the grant. "People must be physically healthy to achieve academic success. We will focus with the students on achieving better eating habits and exercise for stress relief as part of our School Wellness Improvement Plan. Our neighborhood is special, and this school staff proposes to help, to overcome social and personal barriers to learning by developing self-esteem and self-confidence through tennis." After-school programs are also benefiting from Share the Love grants, including at YMCAs across the state. "What a great opportunity to include tennis in our after-school program," said Judi Erickson of the YMCA of Broward County. "This grant will support one of our areas of focus, youth development, where we nurture the potential of every child and teen. It will give more than 400 kids the opportunity to learn the skills of tennis, teamwork, sportsmanship and participate in physical activity while having fun." Tony Domenech, the boys and girls high school tennis coach at Circle Christian School in Maitland, Fla., is using Share the Love grant funding to kick off a new after-school program. "There just aren't any funds to support any extra programs at the school," Domenech said. "I think having an opportunity for the younger kids to see the sport in a less competitive atmosphere like 10 and Under Tennis and Jr. Team Tennis not only lets them participate in tennis in a less competitive format, but one that could be more enjoyable. The more kids that you give the opportunity to be exposed to the sport, the more kids you will see playing, and realizing the chance to play on a high school team, and even in the more competitive arena of college tennis. We currently have a varsity and JV team for both boys and girls, and would like to develop a middle school team also." Share the Love grants are also extended to private clubs that have also felt the squeeze of the economic downturn and do not have access to funding for innovative programs or projects to attract children to tennis. The Hammock Dunes Club in Palm Coast, Fla., is using a Share the Love grant for its "Looney Dunes Family Fun Days," when children ages 4-17 are exposed to tennis, golf, swimming and croquet. "The camps always run at a deficit, and we needed the grant money in order to purchase the 10 and Under Tennis equipment," said Hammock Dunes' Rich Walker, a USPTA and PTR-certified pro. 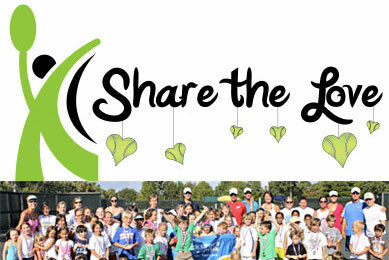 Numerous organizations have also benefited from Share the Love grants to bring tennis into communities, including the Palm Coast/Flagler Friends of Tennis, and Beaches Habitat for Humanity in Atlantic Beach outside of Jacksonville. "Three years ago, local tennis instructor and coach Penny Rauckis and myself introduced tennis to the students using the basketball court to put up nets," said Beaches Habitat for Humanity's Kathy Christensen. "Shortly afterward, the city built two tennis courts at Donner Park and Penny has continued teaching tennis to students. This equipment will allow us to set up courts at both centers, and work toward developing children's tennis in the community. We will be providing lessons at summer camp and are thrilled to get the equipment so that all the children can participate." Palm Coast -- Palm Coast/Flagler Friends of Tennis, Inc.
Naples -- Naples Racquet Club, Inc.
Miami -- Community Habilitation Center, Inc.
For more on USTA Florida "Share the Love" grants, to apply for a grant or see the wide range of USTA Florida grants offered, go to www.florida.usta.com/grants/.